If you are receiving this as an email from me, you won’t see the button that allows you to comment or follow. You have to go to the website (helenaworthen.wordpress.com) and sign up there. Then you’ll see a hot link line at the top of each of my posts that says, “Leave a Comment.” You also get a button that says, “Follow” if you want to follow. There is a comment button at the bottom, too. If you follow, you get everything that’s added to the blog, both my posts and comments. But if you want to comment on those, you still have to go back to the blog website. I appreciate comments. Some of the stuff I am reading is sent to me by people who are commenting. It all helps. Now, for example, I have to go teach a class on Cross Cultural Leadership to a group of students from the International Business Program who speak pretty good English. This class is taught in English. I am going to do a collective bargaining scenario, as an example of a business practice (and also because the midterm exam won’t be ready until next week). This was not in the original syllabus and it isn’t exactly on the list of proposed topics. I’ll introduce it using ideas that Sergio Finardi sent me. PS It went really well. I added two elements — a meeting between managers and investors, to clarify where management priorities should be, followed by a meeting between union leaders and members, to find out if they really had the support of workers. This made it a lot easier for the bargaining teams to stay in role. The class ran from 1 pm to 4:40, whcih gave them enough time to actually propose, caucus, counter-propose and respond, and they very nearly came to an agreement about 4:15, much to my amazement. But then it all broke down — they couldn’t see how close they were, even though I drew a matrix on the board and kept pointing at issues they were close on. They had a good time. I get blank stares when I tell students that the situation in the US is not all it’s cracked up to be. Saying that our Gini index is 41 compared to Vietnam’s 35 (down from 39 a few years ago) doesn’t do the trick, nor does the fact that one in 100 people in the US are in prison, and that the police shot and killed over 700 people last year. Their police don’t have guns. Here’s a different way to explain it. This comes from a document put out in August 2015 by the UN Industrial Development Organization (UNIDO) Country Office in Vietnam: Economic Zones in the ASEAN: Industrial Parks, Special Economic Zones, Eco-Industrial Parks, Innovation Districts as Strategies for Industrial Development. They present five different kinds of economic zones as strategies for development and argue that picking the right strategy depends on understanding the stage of development of the country or region. The category “technology park” is left out of the title. The following is paraphrased from the first chapter. 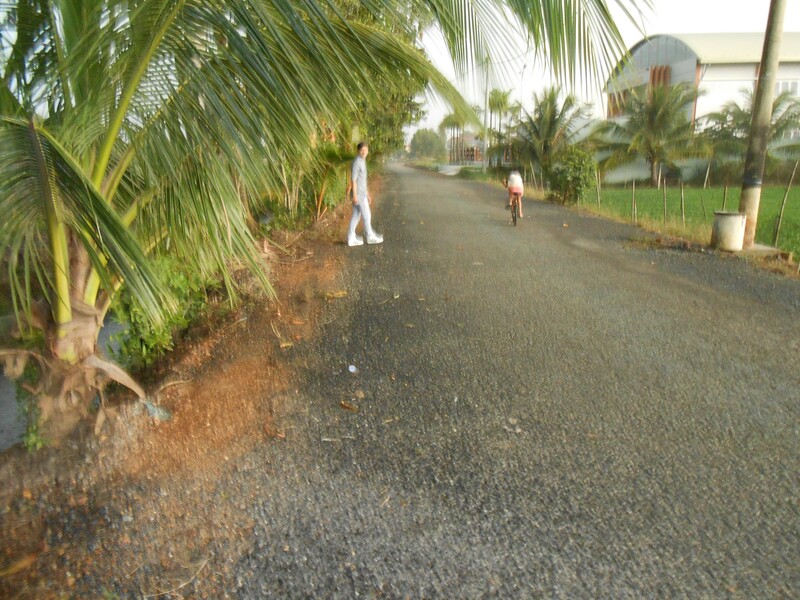 The Industrial Park is for the lowest-developed country or region. It’s simply a tract of land broken up into plots, probably with water and electricity or other services, for the use of industrialists. Special Economic Zones are areas where there are special laws, tariffs, quotas or duties imposed on (permitted for) the industries that are situated there. In an Eco-Industrial park, businesses cooperate together to do as little environmental harm as possible. This is a US EPA definition. A Technology Park “manages flows of information among universities, R&D institutions, markets” and provides high-quality spaces as well as value added. Likely to be located near a university or in a city. Innovation District – an urban Technology Park. 22@Barcelona is given as an example. The neighborhood around MIT in Cambridge MA would be an example. Someone named M.E. Porter wrote an article in the Harvard Business Review [Porter, M. E. (1990). The Competitive Advantage of Nations. Harvard Business Review, 68(2), 73-93] that this report quotes repeatedly. I agree that his categories are worth thinking about, so I’ll summarize. Stage 1: factor-driven. Depends on what kinds of raw inputs there are available: resources, energy, minerals, agriculture, low-cost labor. What factors are there on the ground now? This would be a stage of development where you would expect to find an industrial park. The investors would build the plant, bring materials designed elsewhere (for assembly, for example) and train the workers. The big capital investment is going on elsewhere. Stage 2: investment-driven. The government is able and willing to build infrastructure and create education systems to attract investment long-term. Moving to this stage depends on the creation of business-friendly practices, growing an educated workforce, protection of contracts, access to capital, banking systems. Vietnam is right now moving from stage 1 to stage 2. Can you move to stage 2 without taking care of income distribution? He’s writing in 1990, right after the fall of the Soviet Union and at the very beginning of market globalization. A lot has happened since then. The question for Vietnam is, does long-term economic growth have to take priority over current consumption and income distribution? Is it really “required”, as Porter said in 1990, that you let investment come in and immiserate the workforce? In China, the answer is clearly yes. But does it have to be that way? I don’t think so. 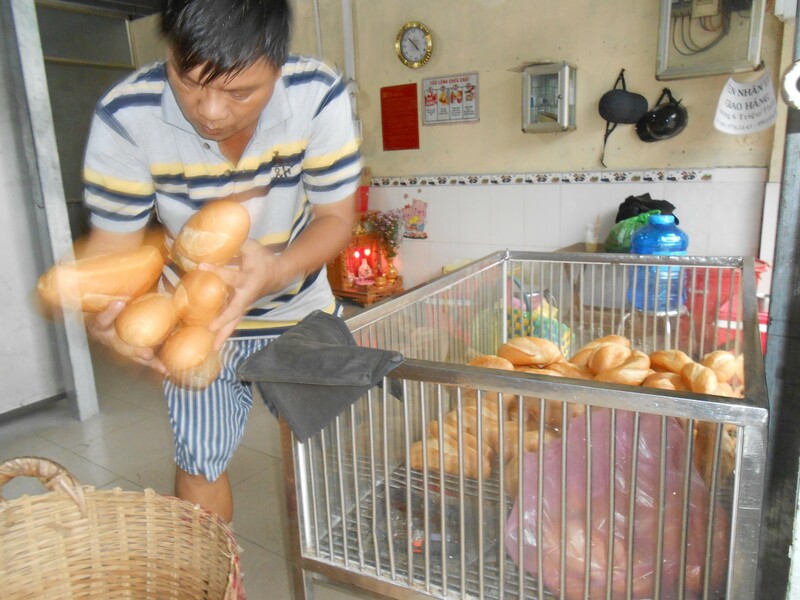 Here’s what the debate in Vietnam over raising the minimum wage is about. 3rd Stage: Innovation Driven. We can look back at Japan in the 1960s’ and 1970’s and remember what it was like to watch another country go from making what we thought of as low-quality junk to just about wiping out our automobile industry. Same with Mexico, after NAFTA, when only Ross Perot and Harley Shaiken saw that Mexican factory workers could build cars just as fancy and hi-tech as Detroit, along with everything else. So at some point in its economic development, a country ceases to just produce things that are designed and invented elsewhere, and starts inventing them and manufacturing them itself. 4th State. This stage is wealth-driven. Now we are looking at the US. The country no longer innovates, they mainly seek to preserve the wealth that they have. How true is this of the US? Well, for most people, the standard of living has gone down and wages have gone down over the last 45 years, since about 1975. The big money comes from the stock market and is blowing in the winds of speculation. I think the US is a wealth-drive nation, and to that extent, is actually in decline. When you look at our infrastructure, the punishment our educational systems are taking, our battles over a $15 an hour minimum wage, you can see it. Just now I was collecting photos from my study of the not-to-be-named power plant, to tell the story of workers pushing to boost the budget for infrastructure repair. The photos show an old, old facility – built in 1949 and fueled by something that should be outlawed. But the struggle was still the right thing and it was successful. Getting out of town was a really good idea. Bottom line: Nghia invited us to his house for lunch on Sunday. His house is a really beautiful place. His mom is lovely. His little sister is lovely. His grandparents, ages 94 and 92, are worth a book in themselves. I have a photo of his grandfather. Yes, I asked permission, although it was all in gestures. Phan Theit is not a “small city,” unless you consider Oakland a small city. 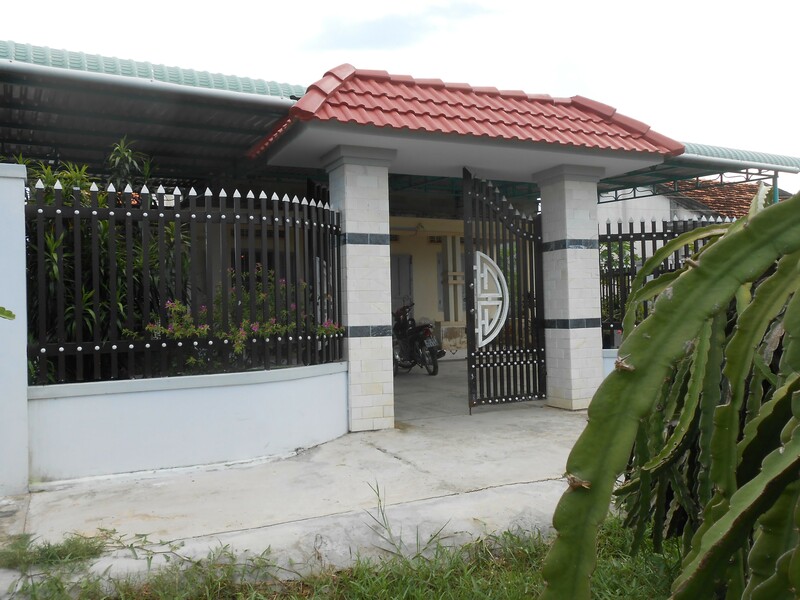 It used to be small, about 20 years ago, when Nghia was growing up. 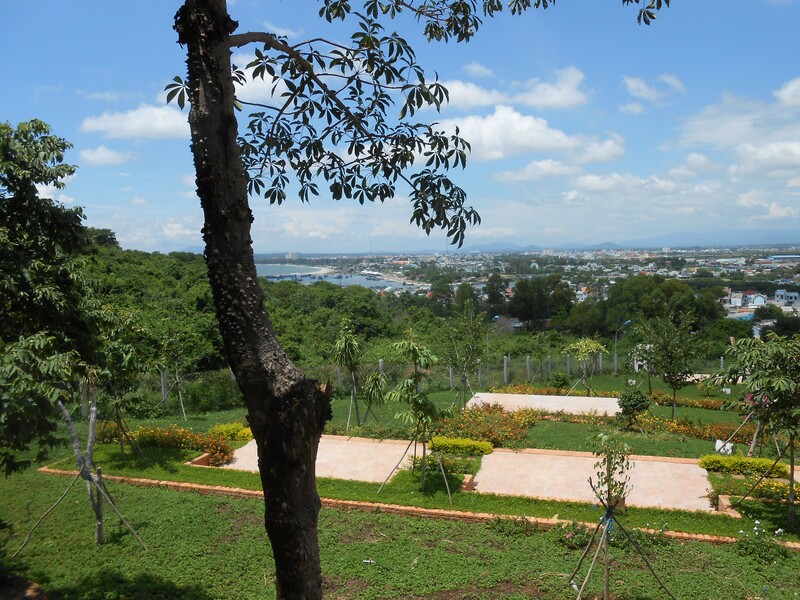 Now it’s gateway to a tourist beach resort center (Mui Ne) and there is an industrial zone nearby. We went by bus. Picture below. Cost, 130.000 dong per person one-way. 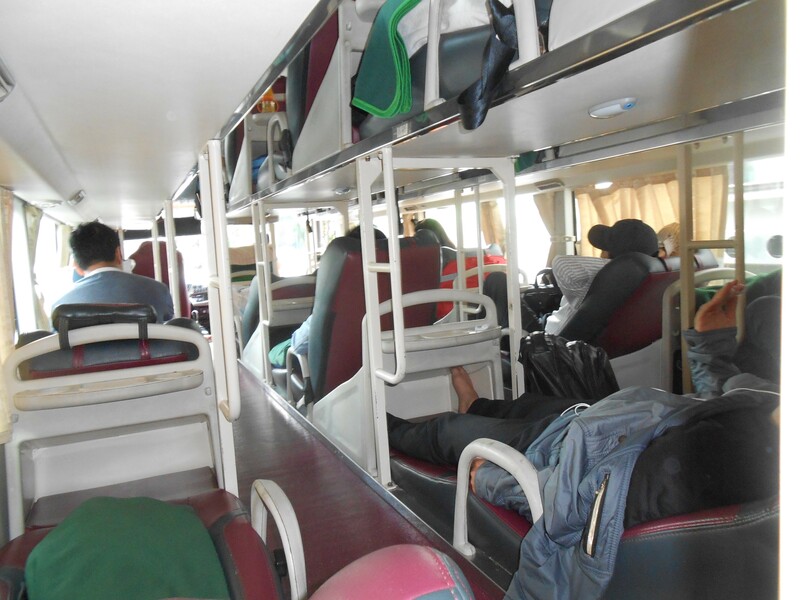 Yes, what you see is a double-decker sleeping bus with what are sort of like fold-down cushioned beds. Made in Korea, for people 5 foot 5 and under. No bathroom on board, but they give you bottles of water. It was a 5 hour ride, because traffic keeps the speed down around 30 mph. We will not do this again unless there is no alternative. Two rest stops each way. The first rest stop was at a nice open eating place that seated about 300 people at tables. Rest stops on the way back was also big, did not smell good. 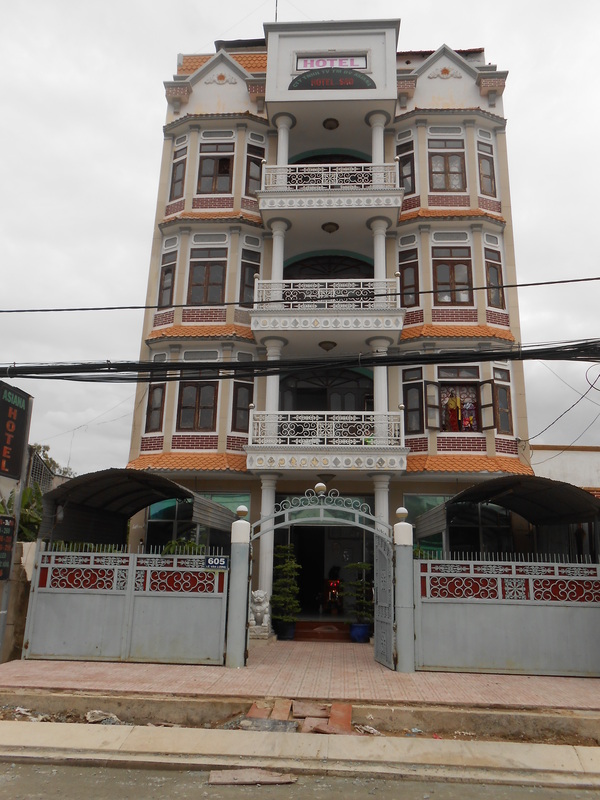 In Phan Thiet Nghia helped us get a room for 180,000 dong that had a perfectly clean floor, bed, air conditioning, bathroom with toilet paper. Then his mom picked him up and took him home; he came back a few hours later on his motorbike, wearing shorts and smiling. 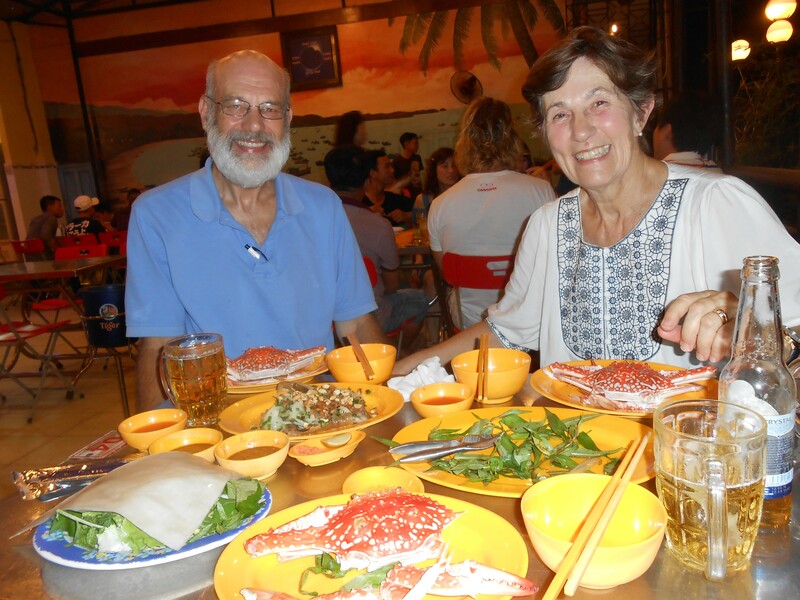 He took us out to dinner upstairs in a restaurant overlooking the river full of bright red, blue and green fishing boats, showed us how to eat crab (“Breakdown”), wrap rice paper around veggies and some other fresh fish, and eat a rice-corn-fish soup. Nothing we ate was more than a few hours out of the sea. Maybe the best meal we’ve had since we got here. The next morning he met us again at 7 am and took us to a place to get “local” pho and then to a Truong Nguyen coffee shop (it’s a chain) and had the best coffee ever. Very strong, very smooth, from a little tin drip. Then off we go on a round of amazing experiences. First, the beach at Mui Ne, where a vast new Miami-Beach type resort climbs the hill over a little harbor where Vietnamese fishermen (and women) clean their nets after a night out on the sea (“Way out, several kilometers” says Nghia) in little hemispheric boats like custard cups – half domes, painted blue, powered by oars. They are people who can’t afford a fishing boat. 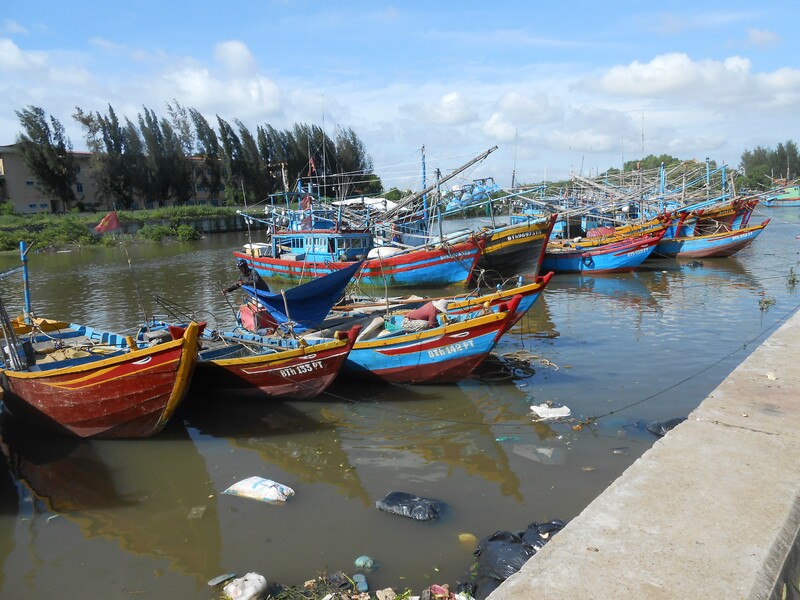 They fish all night, sleep in the boat, come inshore and then clean the little fish – about 6 inches long, silver – and put them in piles that the women then take to the market. The water was warm like bathwater, not like ocean water in California. Second to something called The Wine Castle. I am not kidding. A group of Napa Valley wineries has gotten together to turn Vietnam, a beer country, into a market for wine. They are going to do this by constructing a giant “castle” with four crenellated towers on a hilltop in this resort district and then creating a whole theater of wine culture to educate the local population about not just the taste of wine but how to be a wine drinker and how to live like wine drinkers. Inside the castle is a courtyard with a Cinderella – type gold plated chariot and a bunch of suits of armor. Above it are three floors of Castle Experience. This is a local tourist destination. Young couples were photographing each other. People probably have weddings there. As a piece of marketing this is overwhelming and brilliant and way, way too close to the edge for me. After all, what do I think about when I sit on the deck in California and look out at the sunset on the Golden Gate bridge and have a glass of wine? Just the wine? Tickets are 180,000 each, and include a glass of wine. My first reaction was, “You have got to be kidding.” This is Hearst Castle in Vietnam, only it’s a marketing ploy. I was really going to turn around and go away. But we bought tickets and went in – down windy stairs into a cool dark room where a large crowd of Vietnamese people were sitting on benches holding wine glasses and swirling them and sniffing. It was an actual class in how to drink wine. Then we watched a movie about the Napa Valley and all the happy beautiful people who go to it and drink wine. Just like me, whenever possible. However, since I am on a serious not-drinking campaign, both on general principles and because of my afib meds, and am happy with 2 beers per week, I was not about to drink wine at 9 am, even if I could pretend I was in Napa. But Nghia had never tasted wine. He tasted the wine in his glass and nearly spat it out. He said it tasted horrible, but he continued anyway. Creating a market for something people don’t know they need takes a lot of teaching, starting with basics. You’ve got to teach people to want to be someone else. I guess it’s not that hard. There is by-the-bottle sales room, including some listed for very high prices, in case you wondered if this was cheap wine or good (expensive) wine. You can buy wine glasses, in case you don’t have any. There was also a big room with table settings, showing how you set the table with wine glasses. I was reminded of the upper floor in the Independence Palace in Ho Chi Minh City that held the President’s (Diem and Thieu) private quarters, including a dining room. The dining room was set up as if for a French dinner party, with two wineglasses at each plate. No chopsticks. http://www.rdwinery.com/catalog.pdf It doesn’t say directly that it’s a trade group, but it sure looks like one. Then we went to the Cham towers, built in the 9th century by the people who lived here before the Vietnamese. They’re a UNESCO site. Cham people still live in this area. The four towers are unmortared brick, each a site of worship for different dieties. They picked the best site on the whole coast for these towers, looking south along the shore where the river opens out into the ocean. 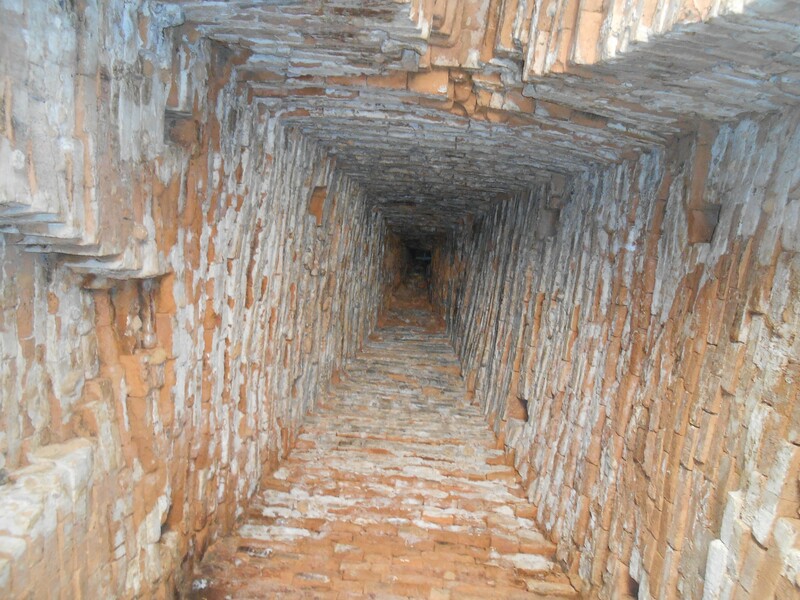 This picture is inside one of the towers, looking straight up. No earthquakes around here, obviously. 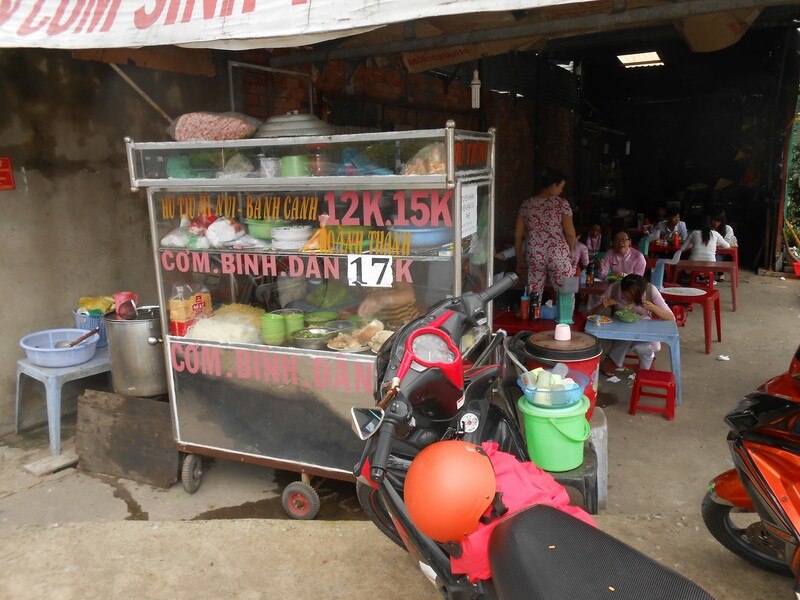 By now we were ready to take a break from tourism and Nghia took us home to his house for lunch. He said, “You will be astonished when you see where I live.” He was right. 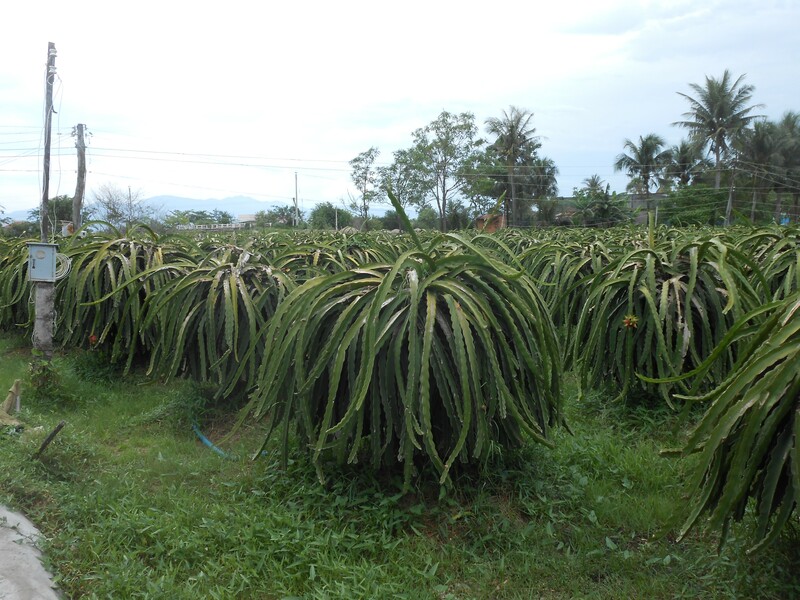 In his village, which is about 5 K from Phan Thiet, people grow dragon fruit. It grows on chest-high bushes that look like the kinds of succulents people put in pots at home. His mom is a primary school teacher in their village. His father died last year, of cancer. His mom also farms the dragon bush plots. 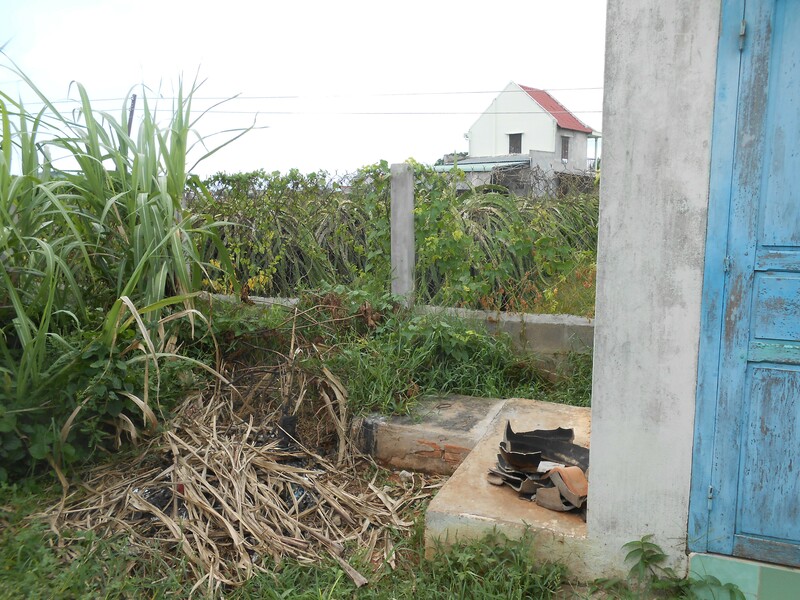 To approach his house, you walk along a 2-foot wide raised dike between the dragon bush plots. The house is beautiful, incredibly peaceful, open to the wind in all directions and therefore cool. His grandparents who are 94 (grandfather) and 92 (grandmother) live with them. They look to be in perfect health except for being very, very old. His mother obviously is terribly proud of her son and happy that he is getting intensive English practice (which he is). Nghia’s little sister was shy but very sweet. When we walked in the house, Nghia’s mother asked me (through Nghia) if I would like a shower. What a great thing to offer someone who is unspeakably sweaty!!! So I went out back and had a shower in a separate room that looked out onto the fields of dragon bushes. 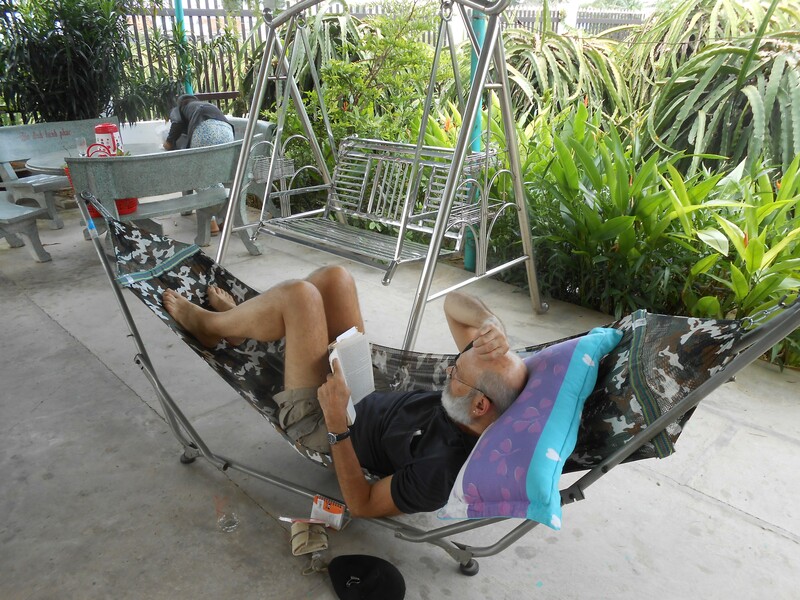 After lunch, which ended with pomelo and salt, we rested; a hammock appeared for Joe and a flat foldout bed for me. I fell asleep, ready to stay there for the next twenty years and get old like the grandparents. Living room. That’s Nghia’s grandfather on the left. 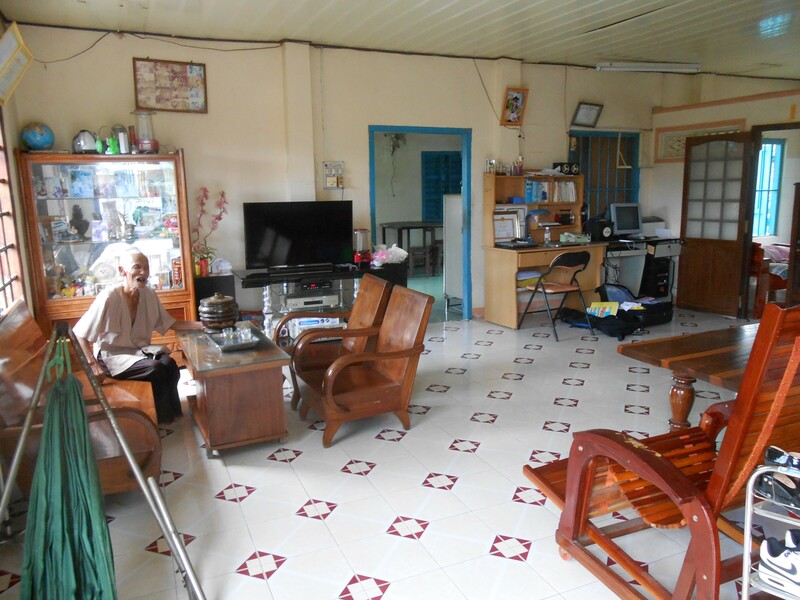 His grandmother sits on the high table to the right, but she’s not in this picture. Kitchen, looking out into side area with more dragon bushes. A few of many cisterns. 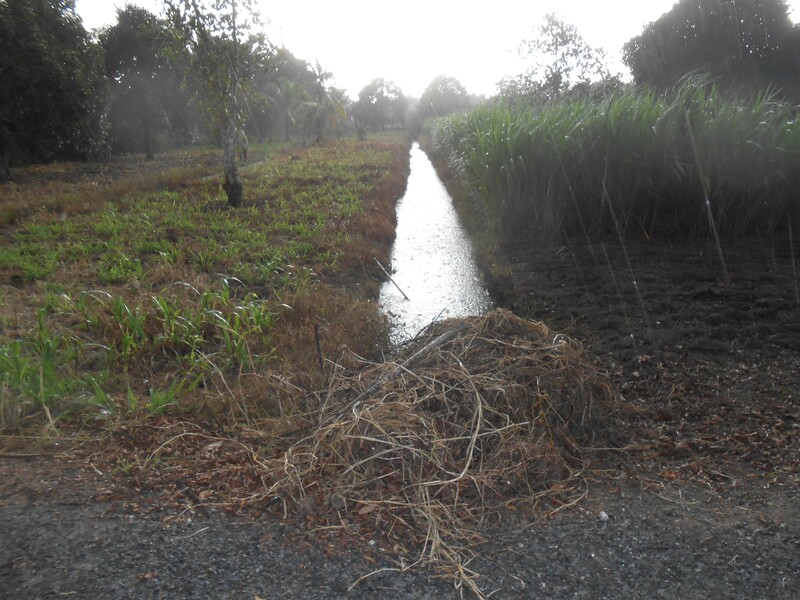 When rains start, they let the water run for a while and then direct it via a long pipe into various cisterns. Lots of electronics. That’s my suitcase on the floor. Most diplomas and certificates are all displayed up high along the top of the wall, but this one is on the desk. Joe in the hammock after lunch. I fell asleep. 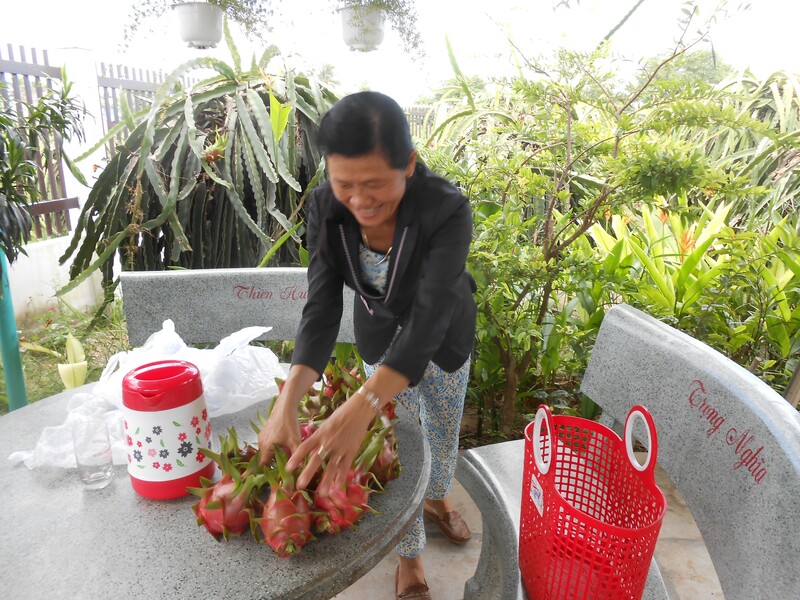 Nghia’s mom rode her bike to their dragon fruit plots and came back with some for us to take home. On the way back to the bus we stopped at the Ho Chi Minh museum which was almost closed; windows shut, no air conditioning. But across the street was the elementary school where Ho Chi Minh taught for a year before getting on a ship and working his way to France. 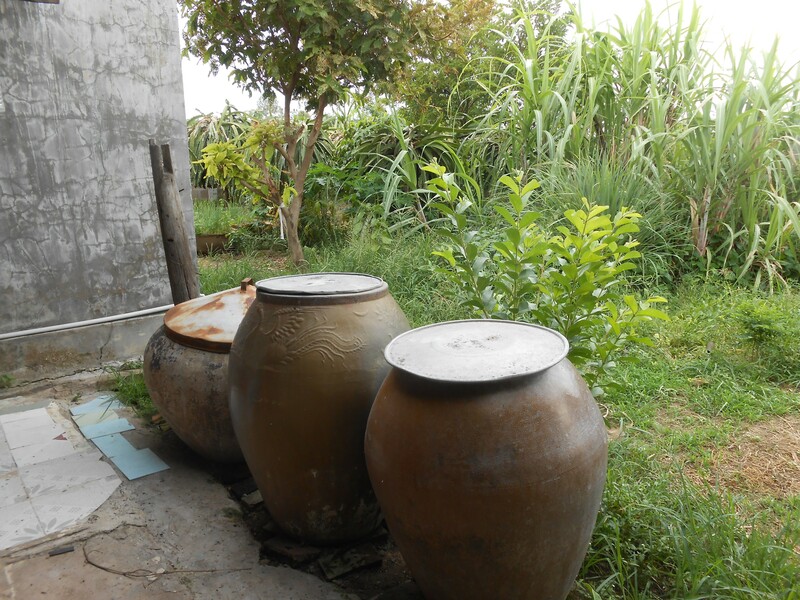 It had small open single story whitewashed buildings, rows of desks like the ones at Ton Duc Thang today, a garden and a well. The bus going back to the city was faster than coming down. Most people slept, including Joe, but I stayed up and read Madame Binh’s autobiography and watched the TV at the front of the bus, which was playing some obviously famous show with a handsome young couple singing first traditional Vietnamese music and then, after many hours of that, some pop and Hollywood stuff on a high-tech Vegas-type stage. Great weekend. 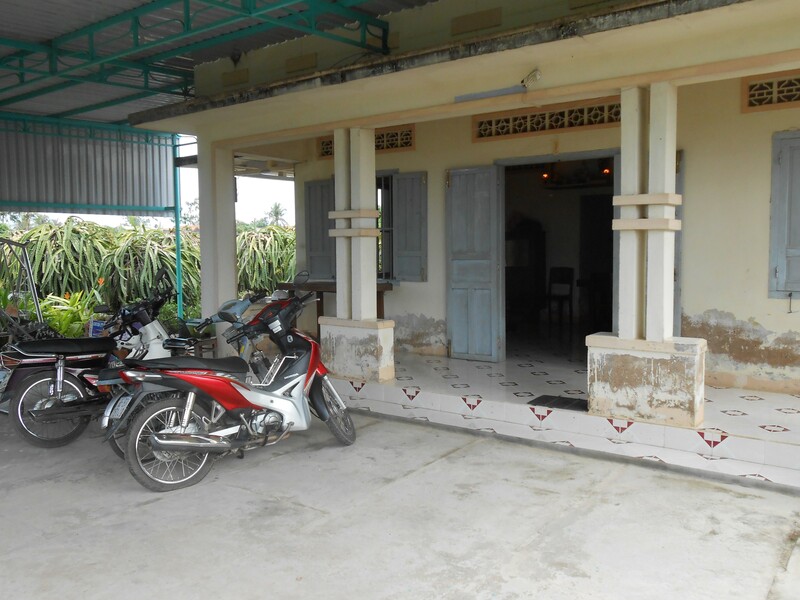 Memories of Nghia’s home will get me through the next blue period. Military training starts at 7 am in the soccer stadium behind our room, sometimes accompanied by orchestral music or commands played on a powerful loudspeaker. New students are inducted into the military right away, issued camo uniforms. After a few days they of mass training they break into groups of 20 or 30 that line up along the road around the stadium, including right in front of our room, and practice marching. 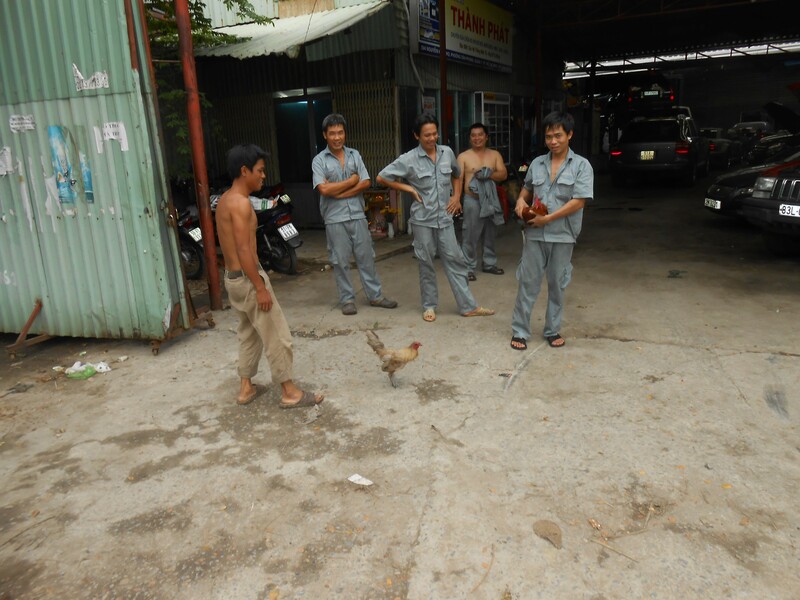 One of them calls out one-two, one-two in Vietnamese while the others learn to swing their arms and step out. We’ve seen them bandaging each other and practicing with rifles and AK-47s that look fairly real. This morning while I ate my pho on the terrace of the canteen I looked out at a group that was stalking step by step through hypothetical trees and bushes, then crawling back on their stomachs, sliding their rifles along beside them. Girls and boys in the same group. 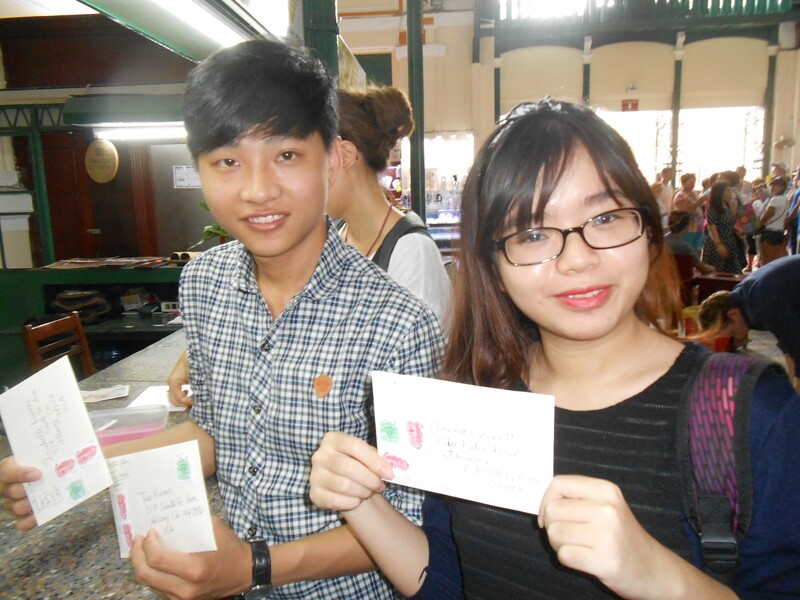 Some catch-up: We went to the Ho Chi Minh memorial museum on Sunday with Thi. 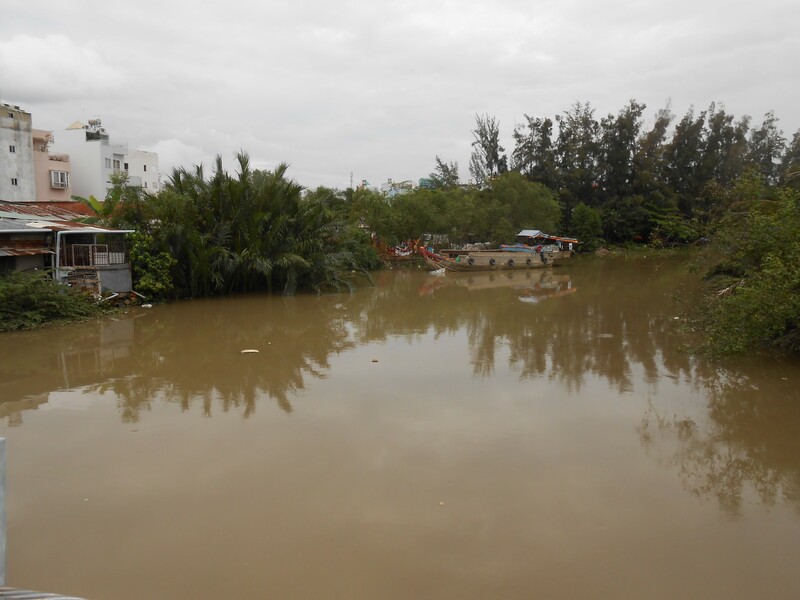 It’s a classic two-story building with verandas all the way around, next to the Saigon River and overlooking an extensive manicured garden and park. The breeze off the river comes in through open doors and cools off the inside. All the exhibits are on the upper floor. It’s photos and documents all the way, so it’s like reading a biography of him. Many documents are in French, such as the report on his activities in France by the French secret service agent who was assigned to watch him. It’s thorough and single minded: this is the story of this person. You are immersed in typewritten reports of meetings; requests for money; cloudy photos of groups of people, mostly men, with Russian, French, Chinese, African names; handwritten lists of people who are in prison and scheduled to be executed (including Ho Chi Minh); rooms in different countries where he stayed and worked. Each room has a map up high with red light bulbs that mark places Ho Chi Minh travelled. All over Europe and Asia; even the US. This is a story that goes from the 1890’s to today. The rooms were quiet and mostly empty except for us and a few other older people. 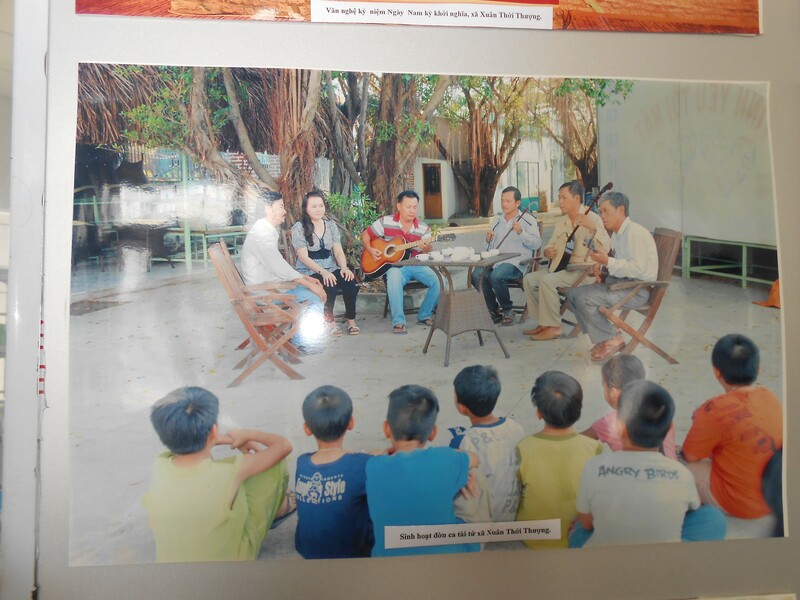 Thi said that the older men who were making their way one-by-one through the exhibition rooms were all speaking languages other than Vietnamese. They looked Asian, however. 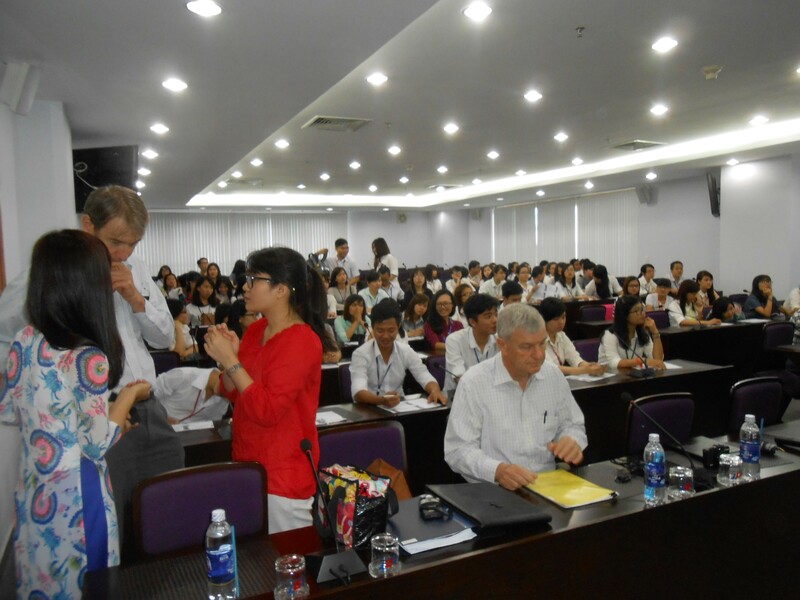 Dean Hoa tells us that he’s looking for academics from the US who would work with TDTU for 2 months a year here in Vietnam and then consult with their program the rest of the year, and cooperate with them on research projects. This is part of the President’s goal of bringing TDTU into the ranks of the top 100 universities in the world, including starting a new curriculum for international students which would be taught entirely in English. The job would include writing or helping people write research that would get published in ranked journals. “Ranked” refers to the journals that get many citations in other journals. We have asked Dean Hoa to write up this announcement with specifics including pay, status, duties, deadlines, etc so that I can put it out on the UALE or LERA lists. There should be a number of people who would be interested in doing this, although no one can guarantee what gets published where, and the ranking system is iffy to say the least. I wrote my 40 multiple choice questions for the Cross Cultural Leadership class (20 for each version of the exam) and sent them over to Hiew who will put them in the correct format. The class really ran away with the assignment last week: they made up their own scenarios to demonstrate cross cultural encounters. Lots of laughter. Three days of major celebrations this week. First, Founder’s Day: Praying at the gold statue of Ton Duc Thang, followed by a celebration (songs, dances, a terrific karate-kickboxing demo, speeches) in the giant auditorium in Building A. In the front row sat the President, who gave an extended speech, and one person away from him was Mr. Tung, the head of the VGCL, a handsome man with a gray buzz cut in a brown suit. Then today we attended the graduation in the same auditorium. This was for the students who completed their studies last spring. More songs and dances (girls in blue, white or red ao dais, boys in white with sparkles on their collars; the dances involve lifts and silk scarves). Then every single graduating student came on stage, hundreds and hundreds of them, had their name read, walked up to a red-swagged podium, shook hands with the president or appropriate dean, received a medal (some), plus diploma and some other framed item, plus a bouquet of flowers. Then a pause while the photographer shoots the student and the administrator. We left after about 3 hours; other people had left as well. Dean Hoa was still waiting for his students to come up. A sense that the event becomes real when it’s photographed. No other evidence required, such as a program listing names of classmates. Sitting behind me in the auditorium was a girl who contacted me a long time ago to correct an email she wanted to send to get support for a “No Money” journey. Turns out she and three friends did it. They made $800 dollars to give to a charity. They got as far as “you could see China”, hitchhiking and staying in people’s houses and eating whatever they were given. They were gone 24 days and just got back yesterday. Apparently hundreds of other kids did it, too. Tomorrow will be an event in which the new students are welcomed. We have special TDT T-shirts to wear to this. It apparently involves a fishing contest. Joe has a bad cough which keeps him up at night. I think it’s related to our taking evening walks near traffic. In our room and on the campus it’s not too bad, but on the sidewalks along the street the pollution is considerable. You can feel it stinging your skin. We’re going to get those masks that everyone wears. Got a good cautionary message from Jocelyn. I wrote this on September 21, four months ago. Only a couple of weeks ago did I find out what Hoc Mon is. 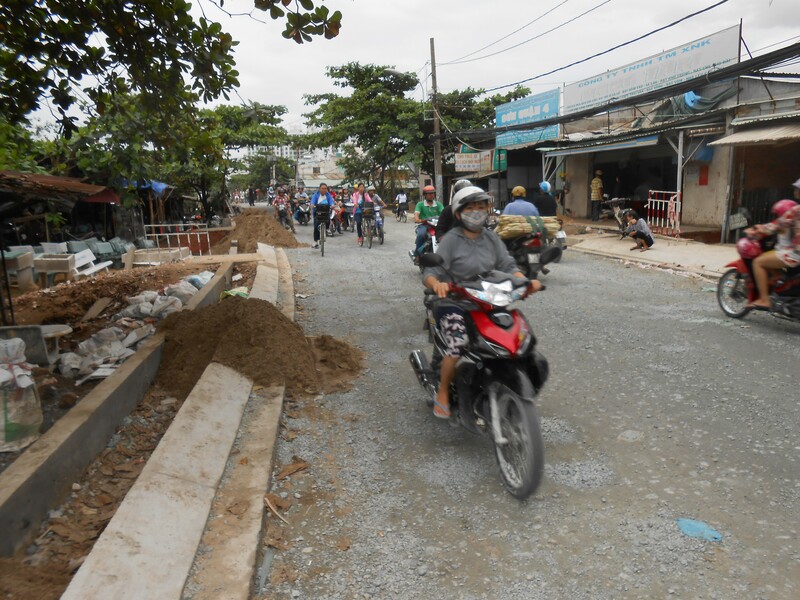 It’s not just any small commune located out in the country west of the airport but east of Cu Chi. It’s at least two other things. It’s a crossroads, for one thing, where the French used to take resisters to get shot. It was an execution site. Second, it was the site of an ambush ( google The Hoc Mon Bridge Ambush) that killed 58 US soldiers during the American War. I had heard that “there was a lot of fighting around there” but I had no idea how much. It was just a battleground. And if you go on YouTube and look at movies of the period, you can see that some of the trees were defoliated and have that distinctive ragged look. 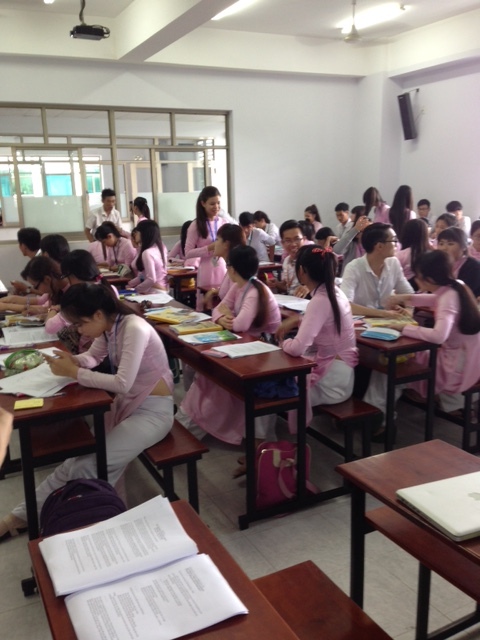 So far, the most engaged students I’ve seen are the ones in the English Zone, who are desperate to learn English but draw a blank on labor or unions, and the ones who came to the collective bargaining simulation on Friday morning. Here are two photos: One of the management caucus and the other of the two teams meeting at the table. Did they actually bargain? No – they squabbled. But at least they got interested and want to try it again. What they learn in the English Zone and in our series of simulations will not show up on the exams. The results of the exams will not reveal what the students are learning. But judging from what we saw on Saturday (yesterday), out at a village called Hoc Mon, they are learning something – somehow, and not from us. My sense that the students are ahead of the system is growing stronger. Phone calls between me and Joe ensued: not only the wire on his hearing aid was broken, but also the battery, in this humidity, was going bad. But the driver of the TDTU van was willing to find him at the service center in District 1. It was near the Post Office, so we stopped there and I mailed cards to Lorenzo, Massimo, Theo and Isabelle and Amelia Crockett in Vermont. When Joe finally came and got in the van, we headed out a long, long narrow road, two lanes of heavy traffic leading north of the city about 20 Km, Hoc Mon. Eventually the traffic thinned out and it started to feel as if we were in the country. Hoc Mon is a village, once small and surrounded by open agricultural land but now on the edge of the city. 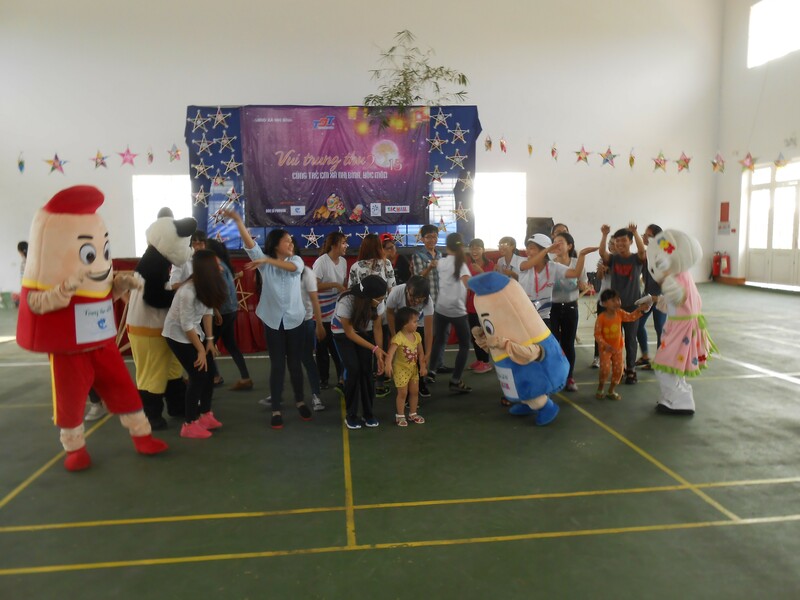 The reason we were going there is because every year the students in the Labor Relations and Trade Unions faculty prepare a celebration for the children of the village. It’s the Autumn Moon festival, the day in the lunar calendar that is in the middle of the month of the autumn moon. The event took place in a large high-ceilinged cement building with a metal roof that is the community meeting and activity center of the village. 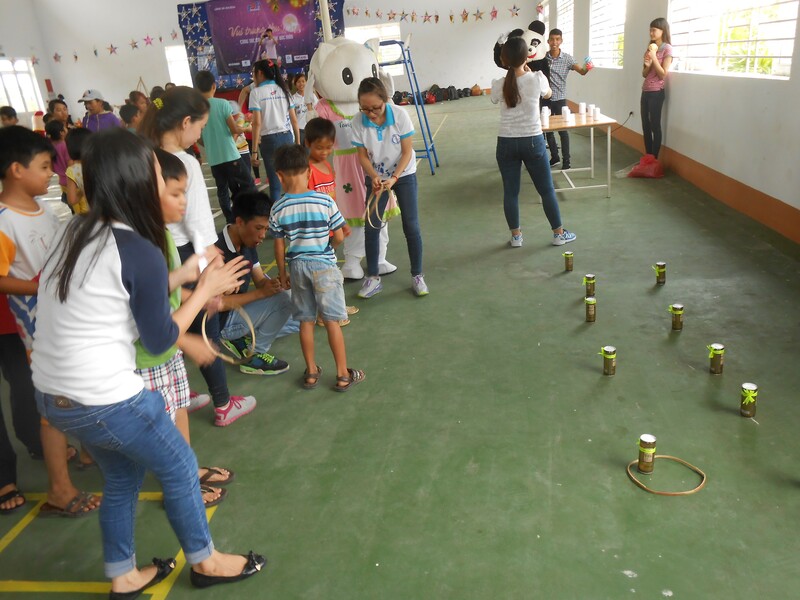 Inside the building, which was all one room with lines painted on the floor for volleyball or badminton courts, the students had set up games like throw-the-coconut-at-the-water bottles, or toss the bamboo hoop over the cans. There was a stage at one end of the room. Adorning the stage were many stars made of colored paper glued to a bamboo frame and decorated with gold and white paper. 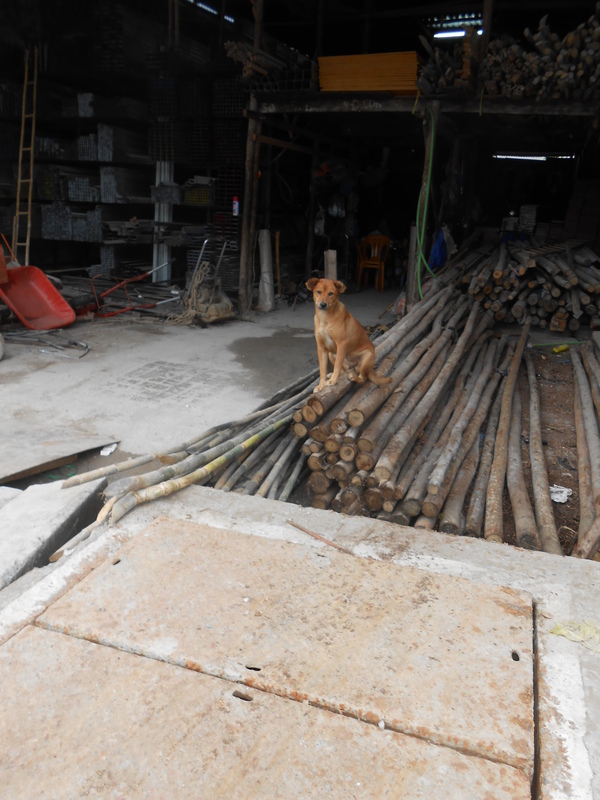 Vinh had told us that the students had made all these stars themselves, even down to making the bamboo frames. They would give them to the children at the end of the celebration, and they’d light candles in them and the children would walk around the village in honor of the Autumn Moon. The whole thing is planned and carried out by students, although Ms La, Mr Quan who works in the department office, and another woman whose name I will learn to spell later, were the original contacts and help. We were the only faculty there. Mr. Quan came and took pictures. 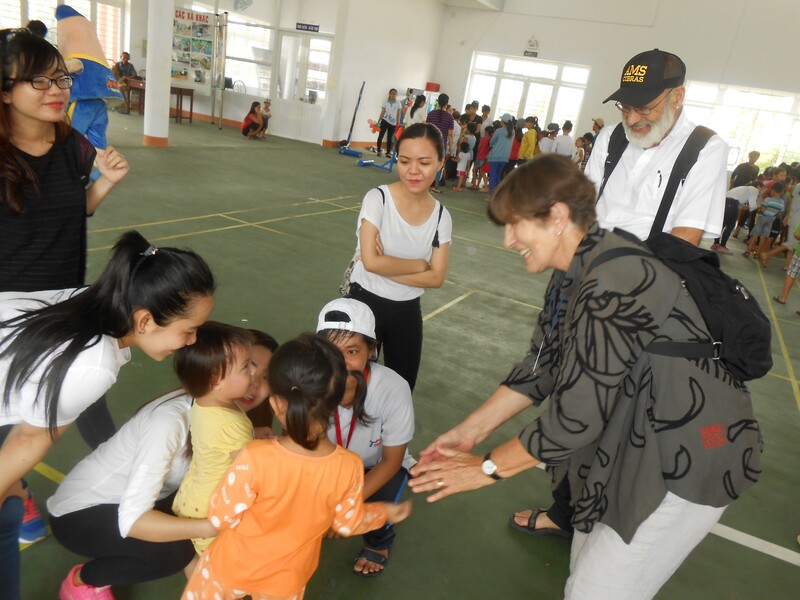 Students were running the games, talking to the children –ages 3 to maybe 11 or 12 – dancing with the children, everything. I recognized most of the students from our classes. There were about 20 of them. They all seemed to be whole-heartedly engaged in playing with the children and making sure they had a good time. There were a few grownups around, but it was really all students, all interacting with each other very creatively and being wonderful with the kids. Like a whole team of big brothers and sisters, and having a good time. The noise in the room was deafening: the hundred children running around, laughing and clapping and playing, plus the music and the announcements from the microphone. 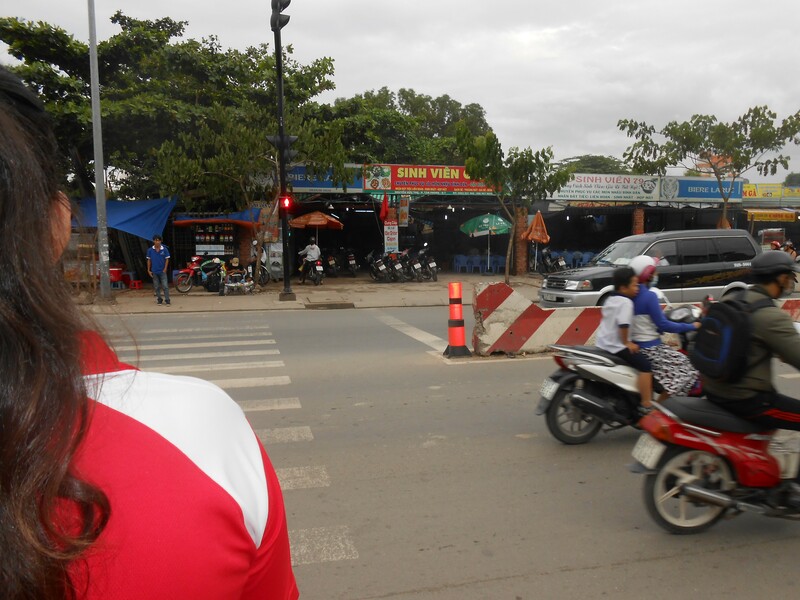 After playing some games we — Joe and me and 4 or 5 students, including Nigha, Thi, and Vy and Anh, all students we have spent some time with – walked down the road outside to see what the surroundings were like. Trees, ditches, houses behind the trees. The community center is in the back right of this photo. A tiny pretty woman with very short gray hair, wearing jade earrings and a purple blouse, came out through the trees and climbed up to the road and talked with us. She told us she was 80 years old and had lived there all her life. We came to a small commercial building which turned out to be a plastics extrusion factory that employs 15 people. We went in and talked with the manager; we’ll talk with him again, I’m sure. He spoke functional English and said that they have a union, that the union is very important. This might be someone we could learn a lot from. Suddenly it started to rain so we hurried back up the road. Nghia ran from tree to tree. I put on my plastic gear. 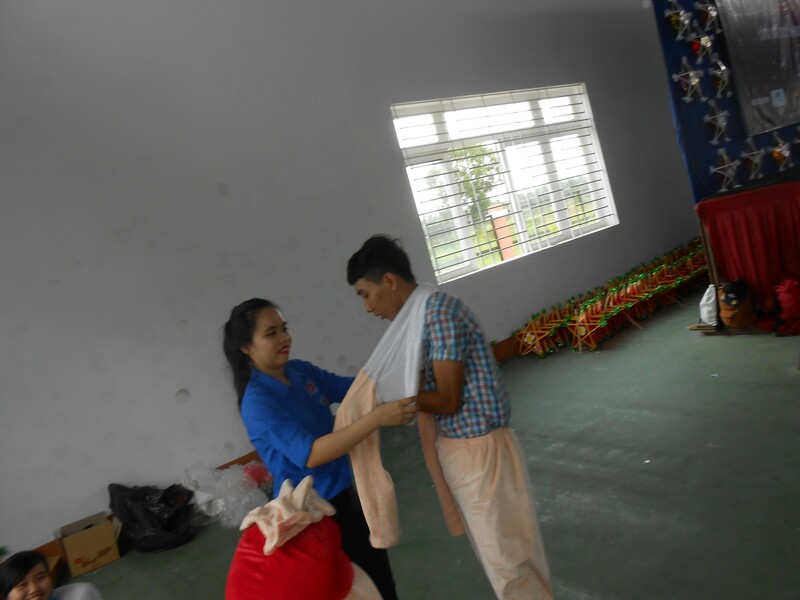 Inside the community center, the ceremony had begun and two of our students were up on the stage, one dressed in a gold shirt who was the Man in the Moon and the other dressed in a beautiful white gown with lace and blue beads, who was the Autumn Moon Goddess. 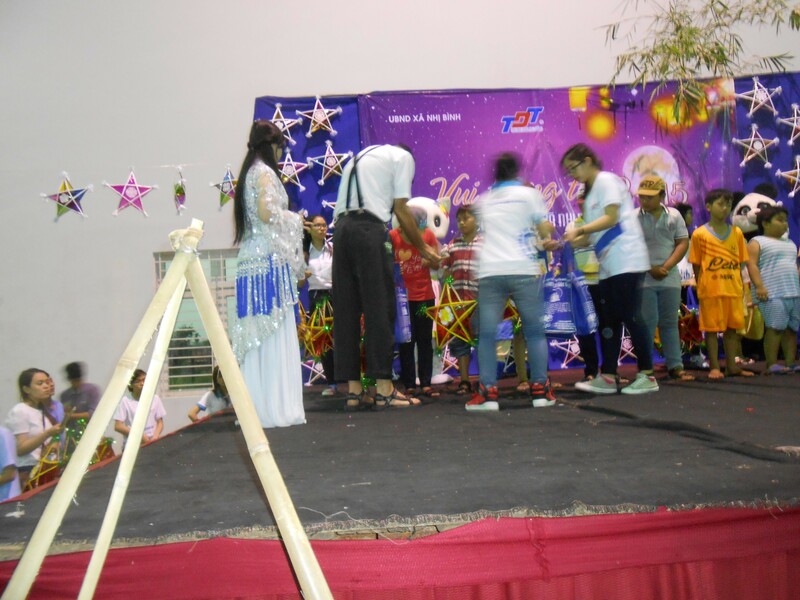 They called the children up on the stage in groups and gave them each a star and a bag of presents. Joe and I were called up to do some of this, too. We met the woman who is the Activity Chairman of the village – a young woman with a big smile. The rain was the hardest and loudest I have ever seen. More than what I’ve experienced as hurricanes. Bottom line: pure fun, completely organized by students, who obviously put a lot of work and some of their own money into this. Not the slightest evidence of cynicism or falseness. Simply: “We want to do something for the children so that they have a good festival.” Offered and received on both ends with complete sincerity and unreserved good will, a pleasure for both the children and the students. Exams: The final exam will be 70% of the student’s final grade. The midterm exam will be 20% and then there is another exam that is worth 10%. The 10% exam floats around the calendar and the teacher gives it when it is appropriate. The final and the midterm are given during weeks set aside for the whole university as exam weeks. The final exam is one hour long and the midterm is 40 minutes. Here is how the exam is prepared and given. First, the teachers write the exams. For the midterm, you have to ask two or three questions. The teacher has to write out what the answers are. This is because the exams are not graded by the teachers. They are graded by a separate department called the Department of Evaluation. The people in the Department of Evaluation do not attend the class, read the book, or know anything about the subject. Therefore they can only grade the exam by matching what the student writes against the answers that the teacher provides. The questions have to have answers that can be found in the textbook or in the class handouts or power points. The Department of Evaluation may ask you to show them where the answers are. The teacher has to write two exams, each one with answers. This is because, should the electricity go out during an exam, they will have to start all over again and unless there is a second backup exam, students will have already seen the exam and it will not be a fair test. So the teacher writes the two exams, writes out the answers to the exams, and puts the whole thing into a format in which each answer is given a point value. The total point value for the midterm exam is 10. So if there are three questions, each question might be worth 2 to 4 points. Each question will have small sub-questions – for example, if a question worth 2 points asks students to list four different characteristics of a certain type of leadership –then the answer to each sub-question would be worth .5 points. After the teacher has written the two exams, they get passed to the Dean for his or her approval. In our case, there have been many back and forths at this level, with Vinh doing a great deal of revising and discussing with us. Once the Dean has given approval to the exam, the exam is passed over to the Department of Evaluation. They may have some opinions about the exam, too. For example, if I include a question that is related to the research project, the people at the Department of Evaluation may notice that nothing in that question seems to have anything to do with “leadership” which is the name of the course. To prevent this, I added a sentence to the question linking the research project and the study of leadership. I do not know where to begin on this. Poor Vinh has to implement this and is negotiating between me and this Department of Evaluation. It makes me want to cry. On the other hand, some of the students seem to think there is something to learn here. This morning we did our collective bargaining simulation. Twenty students showed up. We had only 2 hours. But we did our best and the students, for the first time, seemed to be excited to actually be doing something. They caucused, prepared a proposal, and came to the table. It was extremely hard to follow the bargaining through translation, and in fact I missed the moment when management just told the workers to go ahead and strike – which should have caused the union team to call a caucus and walk out. I could see that there was no concept of discipline, and they were carrying on like a bunch of fussy siblings at a dinner table. But when we stopped them and gave them some criticism, they listened seriously as if they were aware that there was a huge problem here and it was time to do some learning. I suggested that we try it again. They asked for more time – starting at 9 instead of 9:30, and they asked if we could do one that was more closely related to the Vietnam experience. I realized we could do one based on the kinds of stuff that their research projects are producing. I said, “How about Lotte Mart?” and a bunch of them nodded their heads. One guy gave me his email address. The rain has started. The mornings are sunny and cool, but mid-day a light wind starts up and by mid-afternoon there’s a downpour. It falls directly from whatever dark cloud is passing overhead, so it starts and stops a lot. 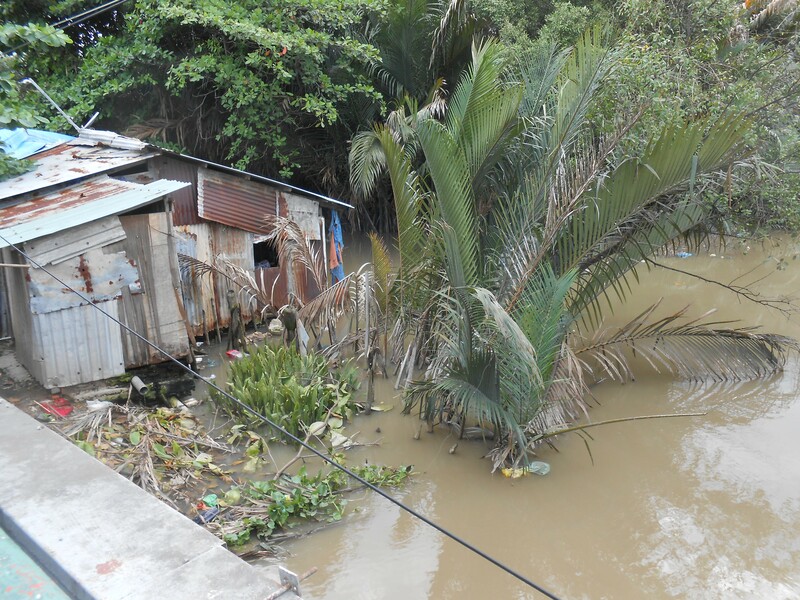 The water in the canal is brown and the gutters are full.The rivers are flowing fast. But people seem a lot happier in the rain. A lot of sudden small groups running around barefoot. A team of gymnasts from some university in Denmark is here on a 5-day visit to “business opportunities” in Asia; the guys are out playing soccer in the soccer field, which is ankle deep in water, a lake, really. Falling down, whooping with laughter. I bought a vast raingear item that I think is really meant to cover you and your whole motorbike, not just you. Last night Joe and I went to Yummy Beer Garden over in the neighborhood east of the Lotte Mart. Lots of restaurants on that street. This was an outdoor place with many wooden tables under a green plastic tent, decorated with green umbrellas. Full of groups of hearty 30-ish men smoking cigarettes and drinking lots of beer, attended by pretty girls wearing sashes advertising Sapporo. Also an interesting group of middle aged women, also smoking and drinking. We had some rice with crinkly noodles, dried shrimp and chives; some mango and beef salad, and then something called “fatty beef wrap carrots and cucumbers fried” which was totally delicious. Walked home in the rain, felt proud about going on a walk by ourselves through traffic in the dark and rain, discovering a new place to eat. We toasted Richard and hypothesized that he liked this place. My cross-cultural leadership class for the International Business program went better. I had the students face each other in teams across benches placed facing each other. Each team represented a country cluster (from the GLOBE study). Actually, it worked best if they chose a country from the cluster. Then they presented their profiles. Still, a whole lot of rote numbers and lists, but at least everyone talked. Then they voted for the best team. Student research project for the Art of Leadership is starting to warm up. Tomorrow is the day for presentations, but not all groups have come to see me. So far: Group 2, Group 3, Group 7, Group 9, Group 10 and Group 11 have showed up for meetings with me. This was part of the big strike over social insurance, resulting in a vote in the Assembly to allow workers to collect their social insurance in a lump sum. They are a bit at loss what to tell them to do. Go back, try to talk to another worker? It’s 40 K on a motorbike. Do some web research, read the labor press? This group may decide to choose another place. 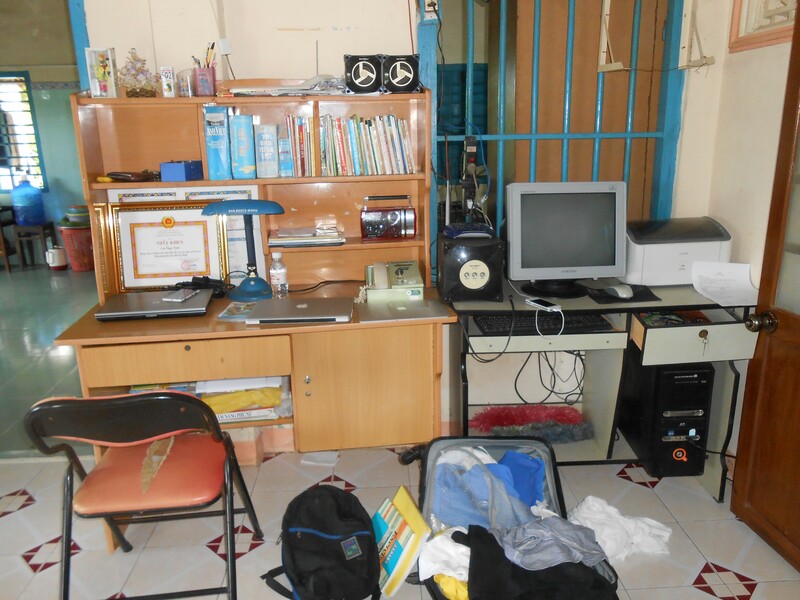 Group 3 is going to report on Tan Phu Trung 1, a kindergarten where the mother of one of its members works. They wrote down “Ca 1” which means the first shift or class period, which is 7 am to 9:15, so I set my alarm for 6 am and got to the office right before 7. I waited an hour and left. Vinh called me at 8:15 right when I was carrying the laundry over to the canteen and said that a group was waiting for me. I ate a quick pho breakfast and got back to the office to meet with the group. From now on I’m going to ask people to write down the exact time, not the “Ca”. 5. What is the working environment like? Are there any problems at work? What is your relationship with the manager like? Has the manager organized any vacations for you? Are you satisfied with your jobs? What is your opinion about getting a better working environment? Can you live comfortably on your salary? These are not good questions to start out with. These are questions about problems. It looks as if they are trolling for problems. They might get thrown out. I suggested replacing these questions with questions from the “Evaluating the Terrain” handout – how many people work there, who owns the property, etc. The “objective” employer and workforce aspects. They left and headed out to this kindergarten. They hope to have more information by tomorrow. She says there are 140 KFC’s in Vietnam. There are 4 managers in her store and 25 workers, mostly students, part time. There is no union at the store; if there were a union, the manager would “be” the union. He would hand out all the information that the union hands out. The place is short-staffed. There is too much work to do. Everyone does everything – cooks, does the cashier, cleans the tables. Lots of people get hired but they don’t stay long because the work is too hard—to much pressure. However, there are many people there who have worked longer than she has. There are no benefits, although the manager takes them all on a picnic together somewhere. 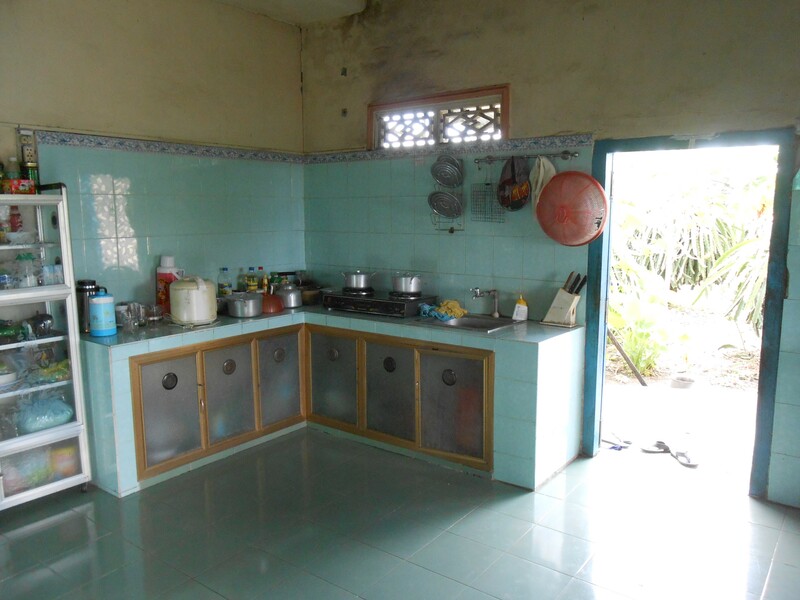 She went into the kitchen and took photographs of all the cooking equipment, the sinks and tables and pots. She also got photographs of people working at the counter and customers hanging around. This will be part of their powerpoint presentation. Group 10 was going to report on the lecturers who work at Ton Duc Thang but have changed their minds; they will report on Vietopia, owned by HIM LAM CO., which has one site in Ho Chi Minh City and a new one opening in Hanoi soon. 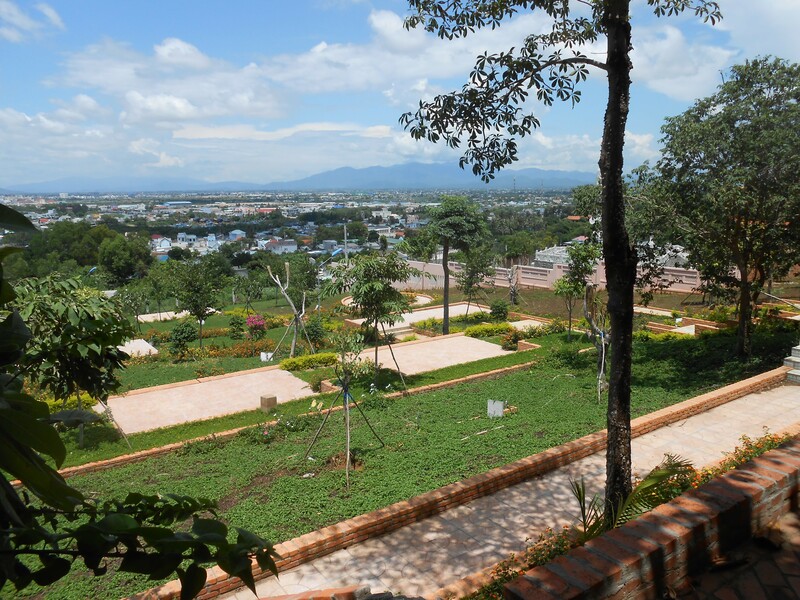 It is a large site, about 14,000 square meters. It is sort of a childcare-child enrichment center that takes kids from ages 5-15. Parents accompany children under age 8; older kids come alone. Entry per month for a parent is 45,000 dong and for a child 280,000 ($12) dong. If a parent wants a 3-month card it costs 599,000 dong ($26). About 2,500 kids come to Vietopia. On a holiday, 2,000 kids are there at the same time. All the workers are under 30 years old. They are from around Ho Chi Minh City, not migrants. 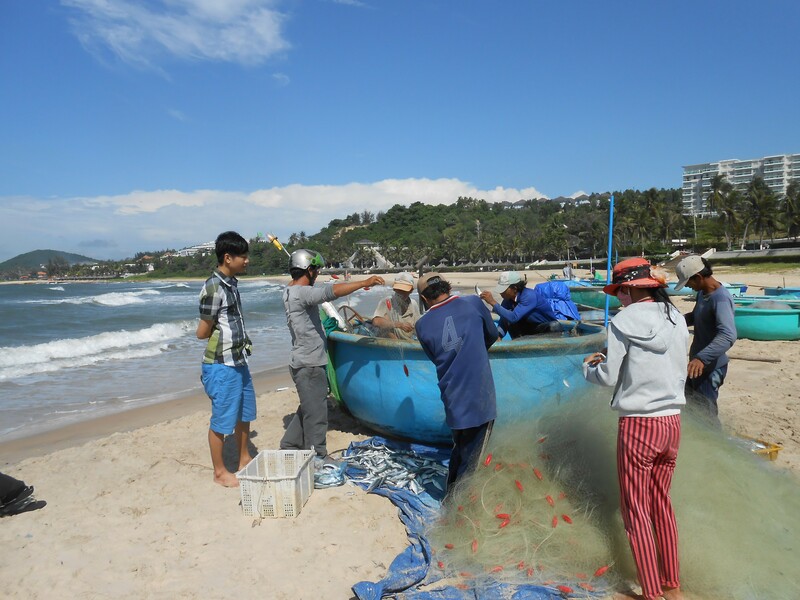 There are about 200 part-timers and 100 full-time workers. The full-time workers earn 3,800,000 dong per month, or 45,600,000 per year, That’s $169 per month, less than the $181 per month that Boulton gave as average for Vietnam. It includes lunch. However, the food is not good. There are 5 supervisors, one for one area and two for the other two areas on the site. The supervisors are “unpredictable” and the workers don’t obey them. One member of Group 10 works at Vietopia. She works part-time, eight days per month, for 4 hours per day and is paid 70,000 dong ($3.12) or 16,000 (71 cents) per hour. This is more than at Lotte Mart, where the pay is 12,000 (53 cents) per hour. Her job involves checking tickets and teaching children about jobs such as doctors, radio announcers, taxi drivers and firemen. She speaks some English. The company gives her a uniform which she washes herself. Each play “job” has its own coat. They also give her 600,000 dong per month ($26) to spend to buy lunch. She does not have a labor contract, which means that she is not a registered worker and the company does not pay social insurance for her. She says that the part-time workers are more or less OK about their work, as compared to the full-time workers who complain a lot and talk about quitting. Group 7, which thought it had an appointment one day but in fact had signed up for a day next week, found me at the gym and we all went to the canteen to talk. They also are doing Vietopia, because two of the young women in the group work there. Their information was about the same. Two additional pieces: The director of the company is a woman but the owner is “someone secret”. Investors include Pepsi and Apollo English Education in Vietnam, which on the web turns out to be a company run by a Khalid Muhmoud, who also runs something called the British University in Vietnam and other operations. One of the young women in Group 7 went to get her pay for this month, which should have been 560,000 (8 x 70,000 D). Instead, it was 540,000. She says this has happened before and to other people. Where did the missing 20,000 D go? We talked about ways to approach the supervisor about this – always in a group, to start with. The leader of that group is a young man who described himself as “intercultural.” He speaks pretty good fluent English and knows a lot about American culture, which he has learned from the internet and friends and cousins in Orange County (“Cam”, which is the word for Orange in Vietnamese). 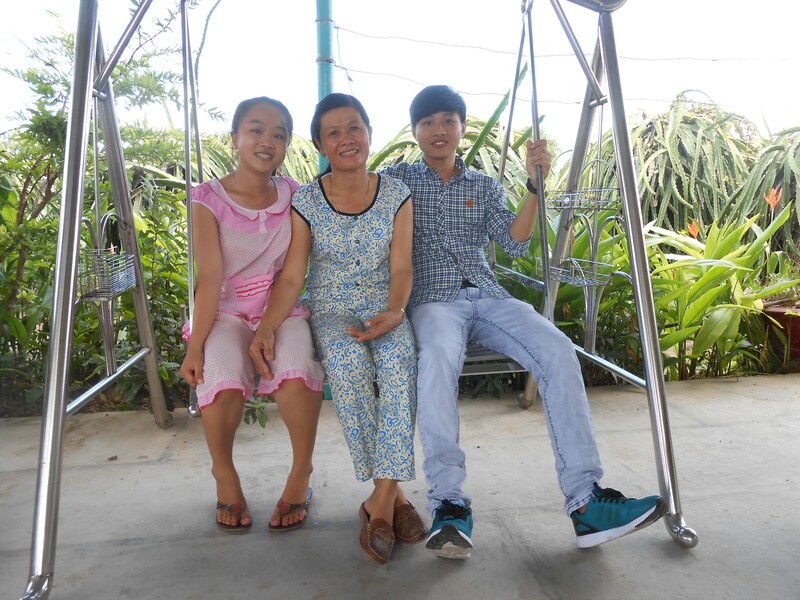 His mother speaks English, and his grandfather, who was in the South Vietnamese military, spoke English and French. His grandfather is now deceased. I asked him our question about why students in classes talk with each other when others are speaking. “Because they don’t care,” he said. 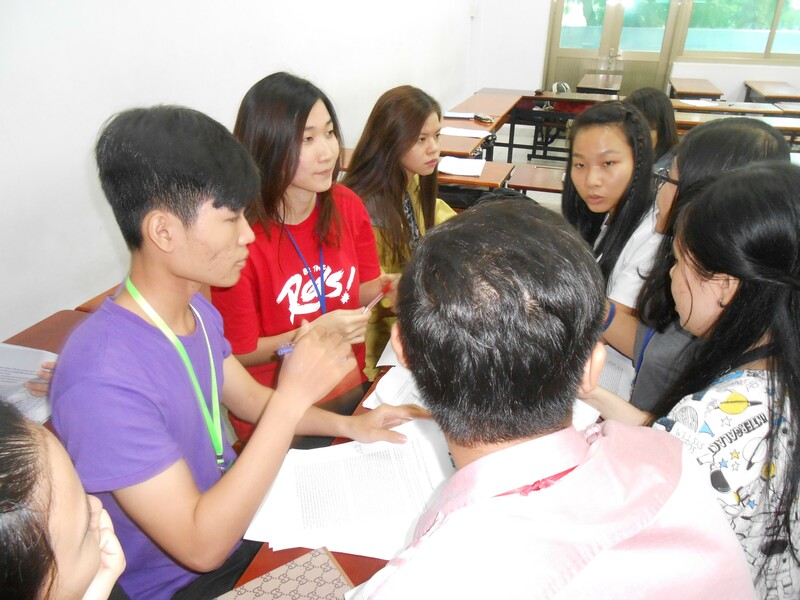 “They don’t know any better.” He expressed a lot of opinions about the Vietnamese education system, saying that many people think it is “garbage,” that the Education Minister doesn’t care and does nothing, and that everything has gone downhill since 1975. Group 9 was originally going to study a garment factory where a brother of one of the members works, but they have decided to do something different and are quite emphatic about it. They are going to look at a furniture shop where another member of the group works. 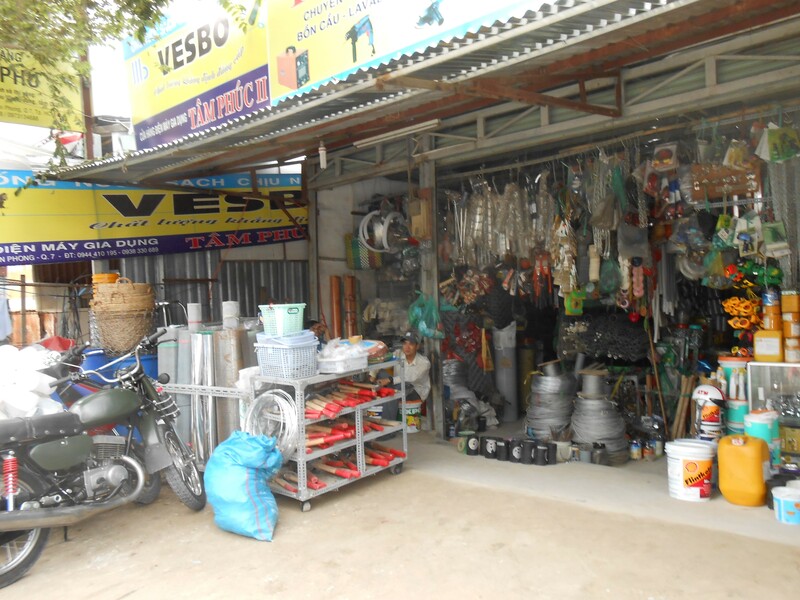 The names of the shop is UMA (Anh Nguyen Company), website http://uma.vn/default/online-shopping/ Amazon carries some of their lighter stuff like little home décor items. 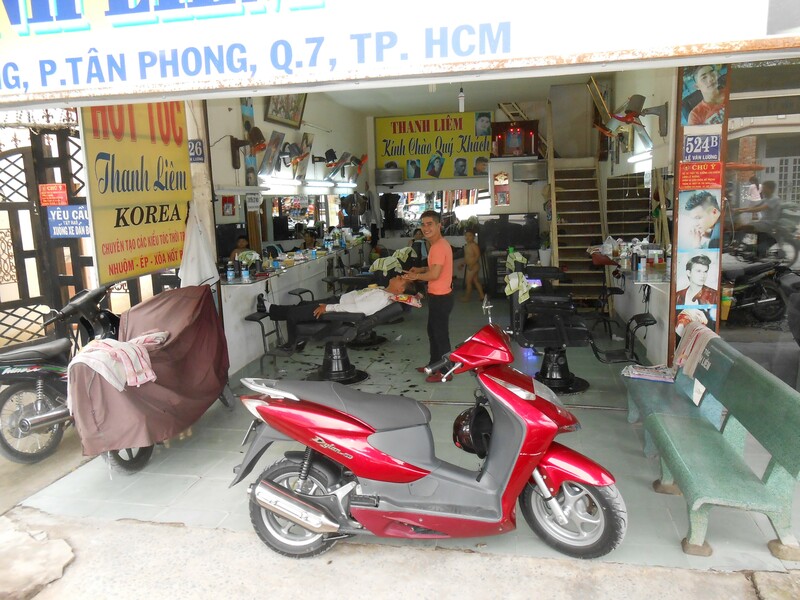 There are 10 shops in this business, one of them in District 7 very near Ton Duc Thang. They sell furniture – middle class, nice but not fancy furniture, the kind of things ordinary people can buy. Looking at the website, I’d say it’s IKEA type, pretty nice and not cheap. The owners are one Vietnamese and two Swedish people. 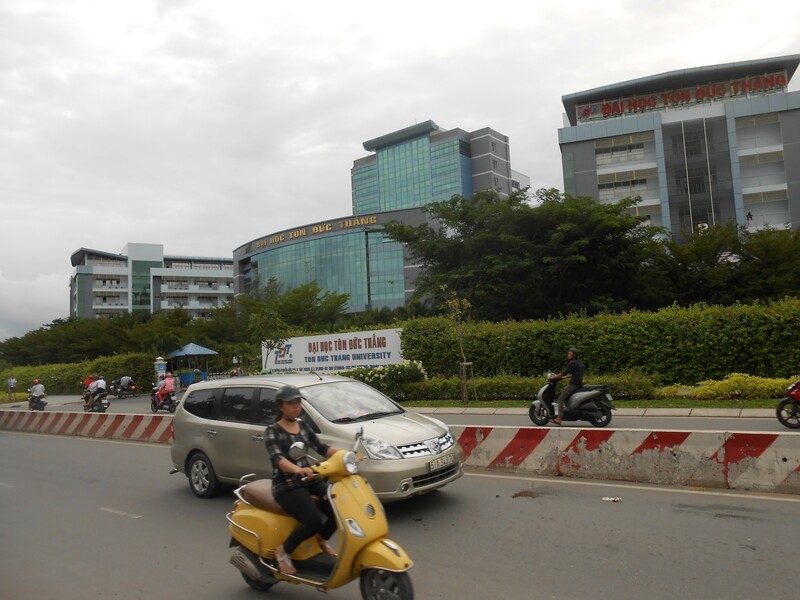 Apparently there are lower taxes of some sort if a Vietnamese person is the “front” for a business; foreigners can then invest at a different rate. It’s been in business for about 10 years. One member of Group 9 works here. She works second shift, from 2:30 pm to 9:00 pm (half an hour for lunch). First shift is from 8 am to 2:30 pm. She works 6 days a week, and also takes 5 classes, going to school in the mornings. She is “temporary staff” and has no contract. There are six people working at her level (two women and four men), 3 supervisors, 1 manager, 2 deputy managers, 3 cashiers, 3 cleaners and two guards. The manager, deputy managers, and cleaners have labor contracts. Her job is to pick up the furniture when it is delivered, check it against a list that tells what it’s supposed to be (inventory) and stock it. She says that everyone is involved in doing this, everyone except the cashiers. She does not know where the furniture is manufactured. She says there is a warehouse where they do repairs and fix mistakes. She earns 19,000 (85 cents) per hour and about 2,700,000 ($120) per month. After she has been there 6 months she might earn what the sales staff earns, which is 20,000 per hour. There is a lot of overtime and no overtime pay. There are no payments into social insurance. The company will pay for insurance if she has an accident. The company provides a refrigerator and microwave and she goes out to buy her lunch and dinner food, brings it in and warms it up and eats it there. 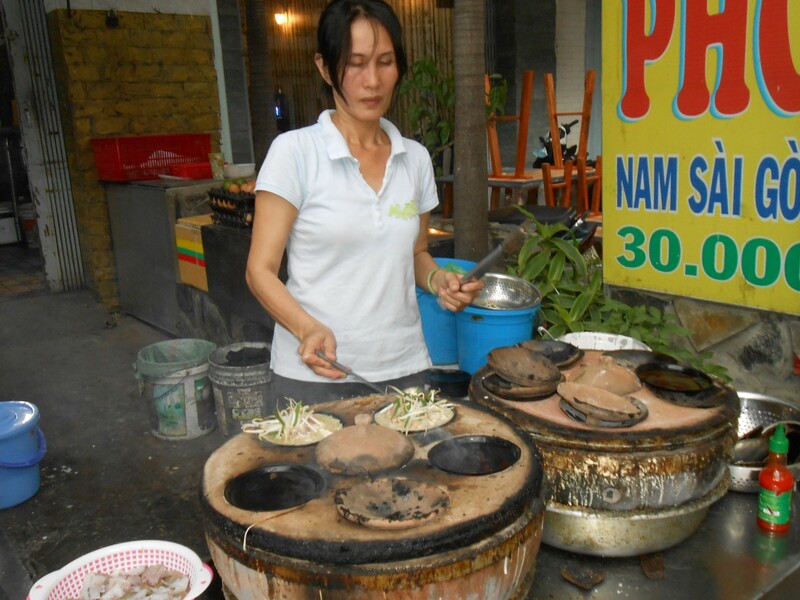 She comes from a province, Dong Nai, about 60 K from HCMC and lives with her sister in a rented room. Right now they are re-building the store, moving all the furniture around and painting the walls. During the rebuilding, they are being given a 25,000 dong subsidy for meals. She says that the workers at this place all say “I feel so tired.” They work hard painting the walls, re-stocking and arranging the furniture. It’s very physical work. They are not all very strong, but everyone does it. Group 11 knows someone who works at Starbucks in a nearby mall. It’s a new shop, just opened last April. 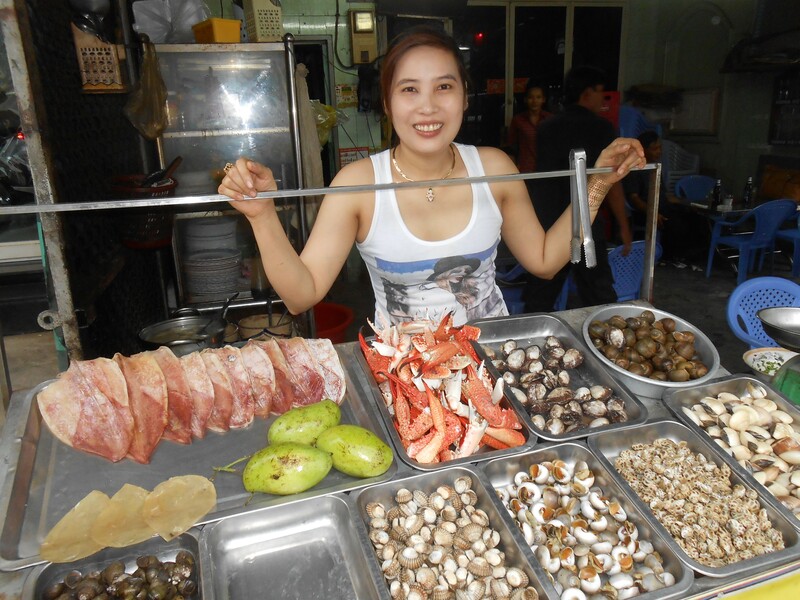 She works part time, which in this case is 4 days a week, 8 hours a day from 6 am to 2 pm and also goes to Tan Duc Thang. She makes 15,000 D per hour. She lives at home with her parents who pay her living expenses and her school tuition. She can keep her earnings from Starbucks and spend them any way she wants. She and a manager open the store in the morning. She prepares the machines, sets up the coffee and arranges the merchandise. Then she is a waitress and fixes drinks. Actually, all the employees do everything. They clean the tables, run the cash register and do accounting, which is how she knows how much money is brought in each day: $60 million dong. All twelve employees (8 workers, 4 managers) are under 30 years old, maybe under 25. They like the job a lot. It has good benefits. She didn’t want to tell the group anything more about the benefits. Mainly, they get to speak English with customers. They gave her a labor contract even though she is part-time and they talked about the union with her, gave her the option of joining the union. Starbucks is owned by Viet Food Media, which has an enterprise level union. However, the Starbucks workers don’t care about the union. They think that they are in a service industry and the union is not relevant. The union does not communicate; it’s form over content. No group that was attempting to talk to someone at one of the manufacturing plants likely to have participated in one of the big strikes is having success in getting anyone to talk to them.